iPad Pro Manual User Guide has specially to guide you the functions and features of your Apple iPad Pro. You can download or read here. iPad Pro is a tablet computer designed, developed, and marketed by Apple Inc. Announced on September 9, 2015, the iPad Pro was released on November 11, 2015. The tablet features a 12.9-inch screen, larger than all previous iPad models. Three configurations are available: Wi-Fi-only models with 32 GB or 128 GB of storage space, and a 128 GB model with Wi-Fi/cellular connectivity. iPad Pro is the first iPad to feature LPDDR4 RAM. Apple iPad Pro runs on iOS 9 by default and it supports picture-in-picture and spilt screen view. iPad Pro Manual Download (PDF, 26MB). 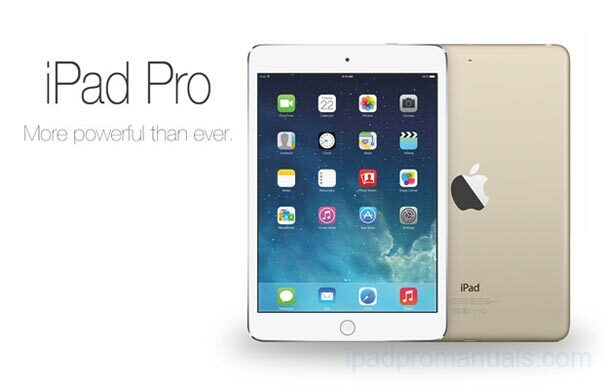 Apple iPad Pro will become available in November in Silver, Space Gray and Gold. The available storage options are 32GB ($799) and 128GB ($949). The LTE model comes with 128GB only and costs $1079.